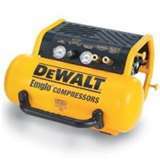 There is a page on this site offering a broad range of information about DeWalt air compressors. Dewalt upright electric compressor will not turn on. I have a 1.5 year old stand up Dewalt compressor that will not turn on. It worked two weeks ago, and now nothing happens. You move the switch from Off to Auto and get nothing. No noise, no nothing. The tank is empty, not full so that is not the problem. It is plugged in to a good outlet, that is not the problem. It is oil less, that is not the problem. Any ideas? I spent $250 on a compressor for home use, I would expect it to last me many, many years. JC, you need to get a multi-meter to check and see if power is flowing through the on/off switch when you turn it on. If power is getting through switch to the motor circuit, next thing I would check would be the start capacitor. See that page for how, if you are not sure. Justin, since you don’t provide me a whole lot of info, it’s hard to figure out why. Please visit the troubleshooting section on the site map page for the page about why air compressors won’t start. There is a bunch of info there about things you can check on your DeWalt compressor. Post back here as a comment when you’ve checked some of reasons out, if you are still having problems with your DeWalt air compressor after reading about the things to check. Power supply is good, tank is empty, no humming, no reset button visible, nothing happens. Just stopped working one day. Can you use a multi-meter to check where power is flowing to, Gabriel? With the compressor tank empty, power should flow from the socket, to and through and ON/OFF switch, to and through the pressure switch, to the motor circuit. If power is getting that far, test your capacitor to see if it’s shorted out. See that page on this site. Add a question here about why a DeWalt electric compressor will not start. Add photos if it will help others help with this issue.